These guidelines were developed by the Healthy Active Living and Obesity Group (HALO) of the Children’s Hospital of Eastern Ontario (CHEO) Research Institute, the Canadian Society for Exercise Physiology (CSEP), ParticipACTION, The Conference Board of Canada, the Public Health Agency of Canada and a group of leading researchers from around the world, with the input of over 700 national and international stakeholders. To view the complete Canadian 24-Hour Movement Guidelines for Children and Youth (ages 5-17 years) click here. 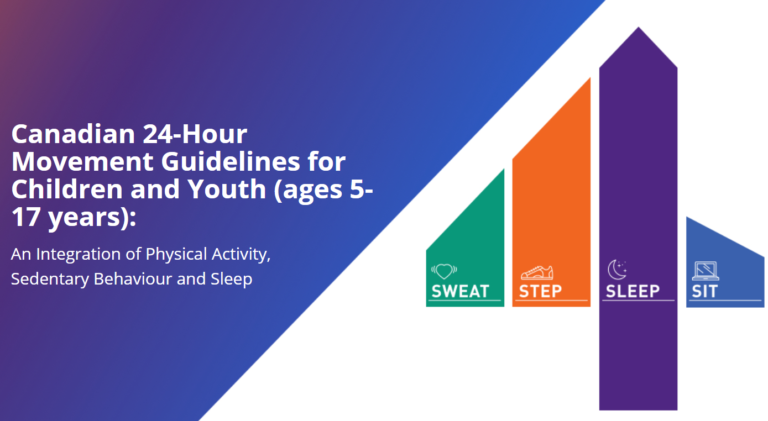 The Canadian 24-Hour Movement Guidelines for Children and Youth (ages 5-17 years)1 encourage children and youth to “Sweat, Step, Sleep and Sit” the right amounts for a healthy 24 hours. According to the Guidelines, a healthy 24 hours should include the following. Accumulate at least 60 minutes per day of moderate to vigorous physical activity. Vigorous physical activities and muscle/bone strengthening activities should each be incorporated at least 3 days per week. Incorporate several hours of light physical activities every day. 9 to 11 hours (age 5-13 years) and 8 to 10 hours (age 14-17 years) of uninterrupted sleep. Incorporate consistent bedtime and wake-up times. Limit recreational screen time to no more than 2 hours per day. Build Your Best Day is a new interactive web experience that lets children and youth learn about the Canadian 24-Hour Movement Guidelines for Children and Youth while planning a day filled with healthy ideas based on things they like to do. Click here to get started. On this site you will also find resources for parents and educators.